Continuous Integration (CI) is a development practice the allows developers to check-in their changes into a shared repository unlimited number of times. Each check-in is then verified by an automated build system, thus eliminating the changes of breaking some other part of the application while fixing one part. By implementing Continuous Integration, you can detect errors quickly and locate them more easily. 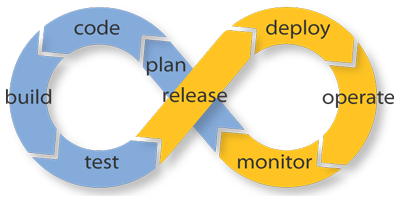 I always recommend to implement Continuous Integration in any kind of software projects. I personally implemented CI multiple times for Java and C++ projects in my career. Now last week, I implemented the same for Salesforce development. In today's post, I will explain how to do that. ANT - You can download the software from here. Git - You can download the software from here. Before we go further, I recommend you to go through the below posts to understand the concept. Version Controlling in Salesforce with Git + Eclipse. Salesforce Deployment Guide using ANT Migration Tool. Best Practices - Continuous Integration Techniques. Below picture will give you a high level overview about what I am going to achieve by implementing CI. After that open your browser and go to http://localhost:8080/. You will find that Jenkins is running on your local machine. Great!! So you have successfully configured Jenkins on your local machine. In this step, we will install Git plugin. You can do that by clicking on Manage Jenkins | Manage Plugins | Available and search for Git. 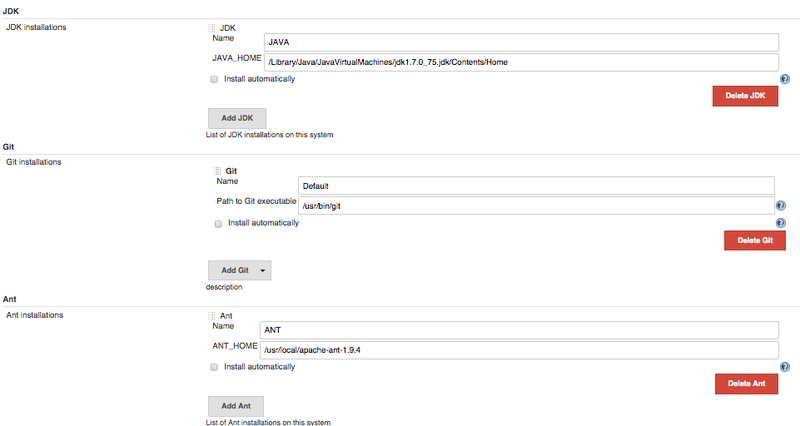 Select Git Plugin to install the plugin and the restart your Jenkins. In this step, we will setup Bitbucket account. For that we need to generate SSH key for authentication. You can use eclipse to generate SSH key. Once you generate your SSH key, please upload the public key in Bitbucket by "Manage Account | Security | SSH Keys | Add Key". You need to save the private key with extension "ppk" in your local machine. In this step, we will configure our eclipse workspace for Sandbox 1 and check-in the code into Bitbucket repository. To do that, first we need to download the Force.com Migration tool from Sandbox. Once downloaded, create a folder "lib" in eclipse and add the ant-salesforce.jar file there. After that add build.xml, build.properties and package.xml. Once added, please check-in the code into your bitbucket repository. In the "Source Code Management" we need to choose Git. Here we need to provide the Git repository URL (Please provide Bitbucket URL for SSH Protocol). For connecting to Git repository, we need to add credentials also. For credential, click on "Add" button, choose "SSH Username with private key". Provide username and paste the key saved in "ppk" file (Step 4). We are done. Now we can use Jenkins to first retrieve the changes from Sandbox 1, then execute the test cases and finally deploy the changes into Sandbox 2. I hope now you can configure Continuous Integration for Salesforce Development. Please provide me your feedback. Thanks in advance. Trailhead is one of my favourite approach to learn new stuffs from Salesforce in an interactive way. I highly recommend employers to encourage all it's developers and administrators to check trailhead and learn new stuffs. Trailhead brings a new module "Lightning Components" which will help developers to understand lightning concepts. In today's post, I will review this new module "Lightning Components". This module comes with 9 different sub modules. All the sub modules are organised so well that at the end of 9th sub module, you will feel really comfortable and at the same time feel the power of lightning which will definitely inspire you to explore the unexplored world. Let's start discussing each sub module. What is all about Lightning Component Framework? What are the different places where you can use the Lightning Component framework? This sub module mainly tells you how you can go for component based development. Google is having Polymer, Facebook is having React and now Salesforce is also having Lightning Framework - Component based development. After completing the challenge, you can earn 100 points. This is the module where you will get familiar with creating lightning components, adding style to that and finally making the lightning component available in Salesforce1. 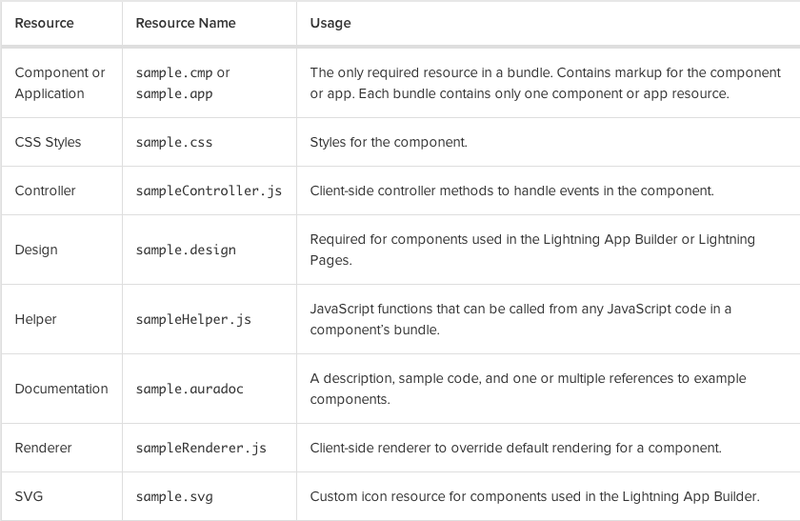 Another important thing you will get to know the list of resources in a component bundle. After completing the challenge, you can earn 500 points. This is the section where you can understand how to use expressions to make your components dynamic, how to pass conditional expressions. If you are comfortable with VisualForce, then for your this sub module will be very easy. But the important section of this sub module comes where you can learn how to refer/get browser and locale information both from component and controller. In this section, you will get to understand how you can make your GUI more attractive by using Standard and Force.com components. You will get to know all the events available to that particular components. At the end of the section, you will get an exercise which is really good for you to check your understanding. For all available component attributes and events, see the component reference @ https://<mySalesforceInstance>.lightning.force.com/auradocs/reference.app, where<mySalesforceInstance> is the name of the instance hosting your org; for example, na1 . This is the section where you can understand how to write client side controller to handle events, create events to communicate between different components. In this module you will know the differences between application event and component event and different types of Salesforce1 events also. After going through this module, I have developed a small application to make myself comfortable with inter component communication. 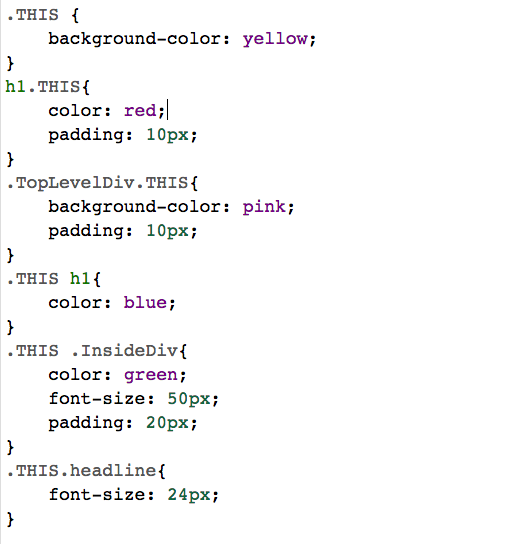 This is the section where you can understand how to load record data and display it in a component. This module will teach you how to call an Apex controller to fetch/edit/save the data. 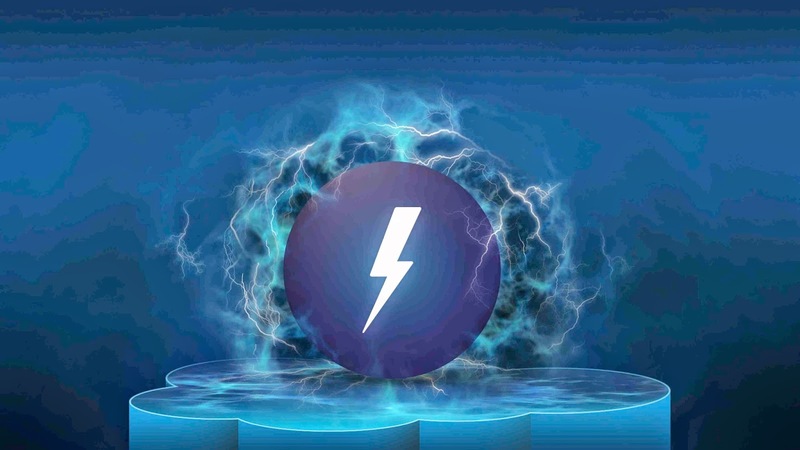 In this section, you will get to understand how to debug your lightning code using $A.log and $A.warning.You will also get to know how to use Debugger statement to examine the code execution in the browser. After completing the challenge, you can earn 50 points. I really enjoyed going through each sub module and now I am feeling inspired to explore more Lightning. I am feeling good that I am having 6 Trailhead badges now. Change Sets - This is available from Salesforce.com site. By using "Deploy to force.com server" option in Eclipse. Using Java based tool - ANT. 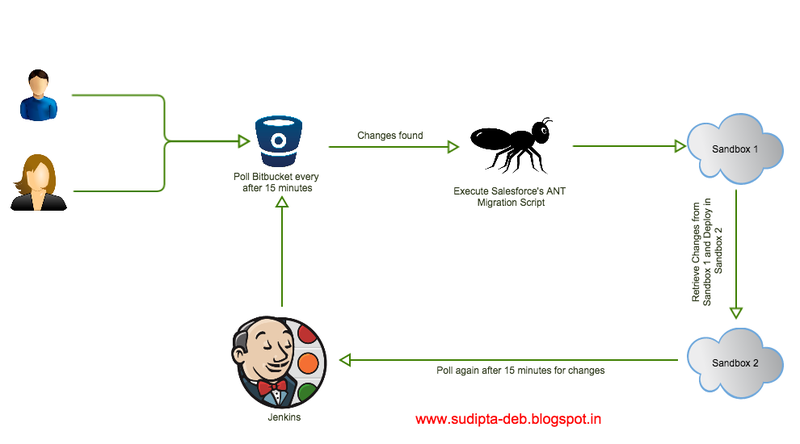 In this post, I will provide a complete deployment guide using Ant Migration Tool. Before I start, let me tell you the prerequisite for doing deployment using Ant Migration Tool. Verify by issuing the command ant -version from command prompt. You should see something like below which indicates your installed ant version. Once you have configured Java and Ant successfully into your machine, it's time to download the Force.com Migration Tool. You can download the same by logging into your Org and then Setup | Develop | Tools and then click Force.com Migration Tool. Once downloaded, extract the zip file and copy ant-salesforce.jar file to the lib directory of your ANT installation path. build.properties - This file will be used to store your Salesforce credentials and other properties in order to run sample ant tasks. Now we will do two exercises here. In first exercise, we will retrieve/download specified items from Salesforce Org and save it in own local machine. And in the next exercise, we will upload the previously downloaded items to our Production Org. In this exercise, we will retrieve/download specified items from Salesforce Org and save it in own local machine. Note - In my Sandbox, I have created a new custom object names Country (API Name: Country__c). This object is not present in my Production environment. What I am trying to do is download County__c and save it in my local machine. Now we will execute the ant command ant fetchNewItems to download the item from Salesforce and Save it into my local machine. As a result, we will see that a new folder with retrieveOutput is created and content from Salesforce is copied into that folder. So COOL. We now know how to copy items from Salesforce Org to Local Machine. Just for your information, you can download not only Custom Objects, but you can download anything like Standard Object, Standard Fields, Custom Fields, Apex Classes, Visual Force Pages etc. The only thing is that you need to mention that in your package.xml file. Now let's move to the new exercise. In this exercise, we will upload the previously downloaded items to our Production Org. This is the same package.xml mentioned in Exercise 1. Now we will execute the ant command ant deploy to deploy the items present in the folder "retrieveOutput" into Production environment. I am sure you are now feeling more comfortable in using Ant for deployment purpose. Please let me know if you have any specific doubts. Thanks. Preface - This post is part of "WebSphere Cast Iron Cloud Integration with Salesforce.com" series. Today I will post how you can use WebSphere Cast Iron for integrating MySQL with Salesforce. Toady, in this example, I will fetch records from MySQL Table and then create the Salesforce object based on that record. So READY, STEADY and GO!! Note: I have used http://www.freemysqlhosting.net/ for creating free MySQL Database. 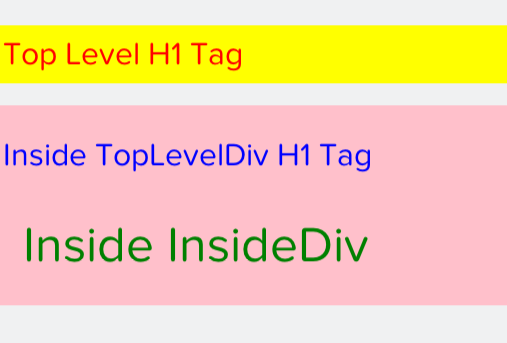 Before we start implementing the above requirement, let's create the Endpoints first. So all set. Now we will configure the integration by putting activities inside the Orchestration. It's time to test the configuration. First we need to start the orchestration and we can do that from Orchestration | Start Orchestration. If you follow the steps mentioned in this post, you will be able to configure this integration very easily. Please let me know if you need any details. Thanks. 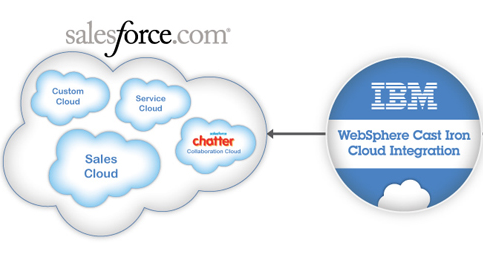 Today I will post how you can use WebSphere Cast Iron for integrating FTP with Salesforce. Toady, in this example, I will fetch a CSV file present in a FTP server, read that file and then create the Salesforce object based on that record. Finally I will send the response also. So let's not waste time here and get straight into the business. Below is the CSV File(All_Airports.csv) I would like to read and load from FTP server. Once done, the final requirement is to create Salesforce records based on the data present in the CSV file. Create a default HTTP endpoint with port number 80. Now we will create the Flat File Schema as shown below. This flat file schema will be used to read to CSV file present in the FTP server. Below you will find all the configuration details related to Receive Request activity. In this activity we will create Salesforce records for the custom object Aiport__c based on the data from the previous activity. Below are the details of the configuration. Below are the configuration details for this step. 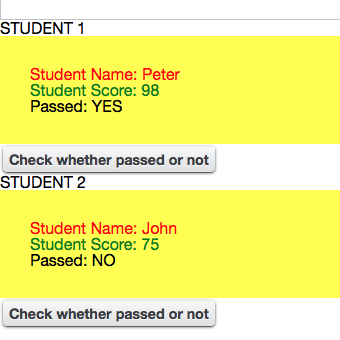 I have used a Chrome Extension named DHC for my testing. You can do HTTP POST by clicking on Tools | HTTP Post Utility. In Salesforce also, records are created. If you follow the steps mentioned earlier, you will be able to configure the integration very easily. Please let me know if you need any details. Thanks.